Persecution watchdog groups are pleading for the U.S. government to take a leading role in fighting "genocidal hatred" of Christians after the latest slaughter committed by terror group ISIS, where a total of 30 Ethiopian Christians were shot and beheaded in Libya. They warned that if ISIS' "religious Nazi ideology" is not countered, it will continue inspiring more atrocities. Open Doors USA President and CEO David Curry, along with The Simon Wiesenthal Center's Associate Dean, Rabbi Abraham Cooper, and Director of Interfaith Issues, Rabbi Yitzchok Adlerstein, issued a joint statement on Monday. "We have been warning Western governments for months that a religious genocide of Christians was taking place. While we welcome the White House acknowledgment that these victims were targeted because of their faith, much more needs to be done," they said. The statement added that the Obama administration needs to recognize the religious extremism behind ISIS' actions, and must lead the way in combating "genocidal hatred" to protect endangered Christian communities in the Middle East. "We must not stand idly by and watch as thousands of Christians are murdered for their faith. If Americans truly value freedom of religion, let us hold that value high and demand more be done to protect religious freedom around the world. Governments and NGOs should treat the rights of religious minorities as core human rights," the groups said. "This truth must motivate our nations. If we fail to counter ISIS' religious Nazi ideology, it will continue to infect the hearts and minds of the ever-growing number of youth around the world, ultimately leading to more senseless persecution and bloodshed. The time to act is now." ISIS posted a video on Sunday depicting the executions of two groups of Ethiopian Christians, and explained in the narration that it is taking "revenge" for "shed Muslim blood" in the region. The Islamic militants, who have captured territory throughout Iraq and Syria and have moved into other countries, like Libya, directly addressed "the nation of the cross" and said that more bloodshed is to follow. 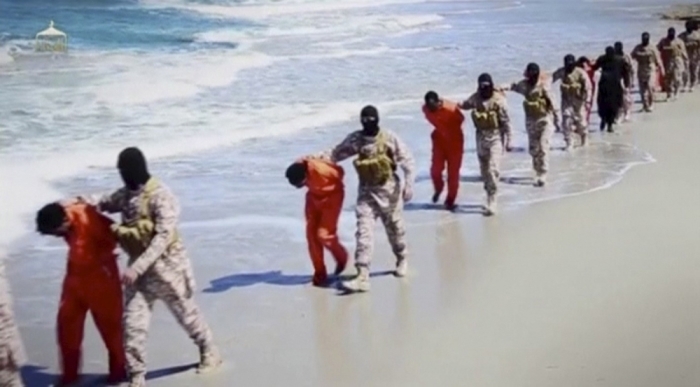 The video is similar to one released in February, when ISIS executed 21 Coptic Christians. 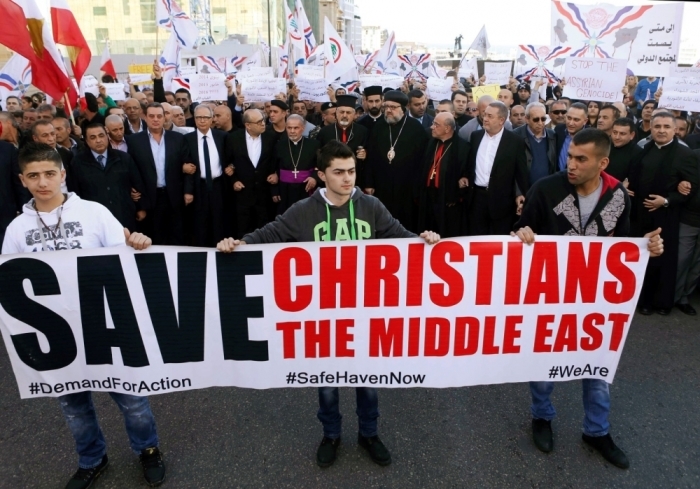 The jihadists are also asking for $30 million to free up to 300 Assyrian Christians it kidnapped during raids on villages in February. Obama's administration condemned the latest killings and said through National Security Council spokesperson Bernadette Meehan: "We express our condolences to the families of the victims and our support to the Ethiopian government and people as they grieve for their fellow citizens," the statement read. "That these terrorists killed these men solely because of their faith lays bare the terrorists' vicious, senseless brutality." International Christian Concern, which has also been documenting the slaughter of Christians throughout ISIS' drive to implement an Islamic Caliphate on the region, noted that the Ethiopian government is observing thee days of mourning for the victims. Qes Solomon from the Ethiopian Orthodox Church said: "My sorrow is beyond depression." ICC has called on more to be done to protect the persecuted minorities under threat from ISIS. ICC's regional manager for Africa, Troy Augustine, added: "ICC condemns the deplorable murder of these Ethiopian Christians by ISIS. The world should be awakened to the reality that Islamic extremist groups will stop at nothing to advance their brutal terrorist agenda, and that Christians continue to be at the center of their target. As such, ISIS represents a severe and expanding threat to the safety and security of Christians in the Middle East and North Africa." Roman Catholic Church leader Pope Francis has also condemned the massacre, and said that the world must pay attention to such horrors. "The blood of our Christian brothers and sisters is a testimony which cries out to be heard by everyone who can still distinguish between good and evil. All the more this cry must be heard by those who have the destiny of peoples in their hands," the pope said.